Struthers, James. "Great Depression". The Canadian Encyclopedia, 10 September 2018, Historica Canada. 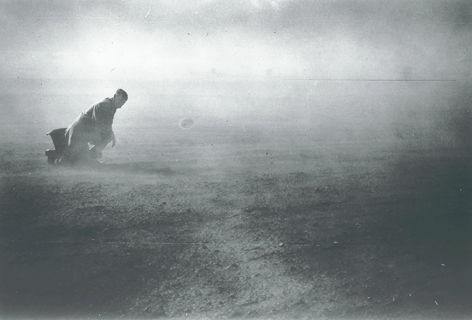 https://www.thecanadianencyclopedia.ca/en/article/great-depression. Accessed 25 April 2019. Economists still debate whether a specific event might have sparked the Great Depression, such as the 1929 crash of the Wall Street stock market. However, there is general consensus that the Depression was the result of widespread drops in world commodity prices and sudden declines in economic demand and credit, leading to rapid declines in global trade and rising unemployment. In Canada the changes were dramatic. Between 1929 and 1933 the country’s Gross National Expenditure [overall public and private spending] fell by 42%. By 1933, 30% of the labour force was out of work, and one in five Canadians had become dependent upon government relief for survival. The unemployment rate would remain above 12% until the start of the Second World War in 1939. The Depression's effects were aggravated by its uneven impact, by a rudimentary social-welfare structure and by misguided government policy. A third of Canada’s Gross National Income came from exports, therefore the country was hard hit by the collapse in world trade. The four western provinces, which depended almost exclusively on primary-product exports, were the most seriously affected. 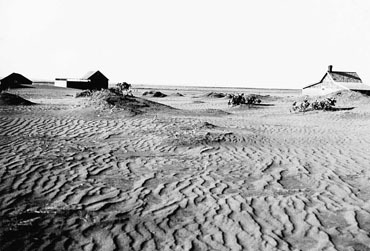 Farms in the west such as this one were devastated not only by erosion but also by droughts and plagues of insects (courtesy Saskatchewan Archives Board/Saskatchewan Wheat Pool Collection). The economic problems were made worse on the Prairies by years of drought, as well plagues of grasshoppers and hail storms, which caused huge crop failures. Saskatchewan experienced the lowest price for wheat in recorded history and saw provincial income plummet by 90% within two years, forcing 66% of the rural population onto relief. The other western provinces were technically bankrupt from 1932 onwards. 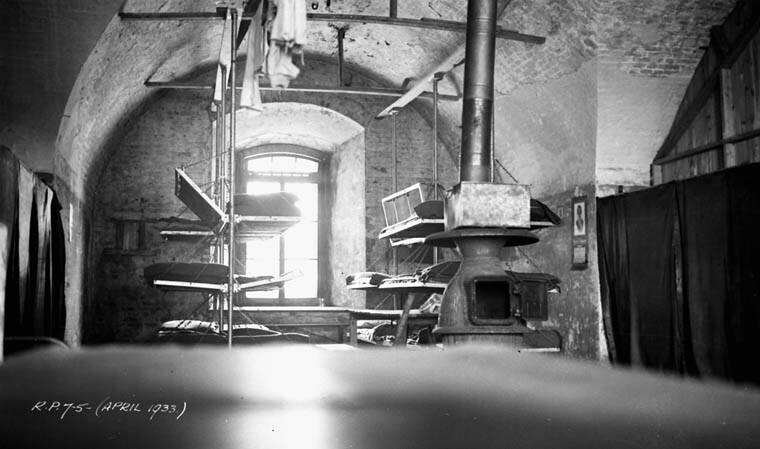 Although Ontario and Québec experienced heavy unemployment, they were less severely afflicted because of their more diversified industrial economies, which produced goods and services for the protected domestic market. The Maritimes had already entered into severe economic decline in the 1920s and had less distance to fall. The burden of the Depression was also unequally distributed between classes. Although wages dropped throughout the 1930s, prices declined even faster. As a result, the standard of living of property owners and those with jobs increased. Farmers, young people, small businessmen and the unemployed bore the brunt of economic hardship. Demographic changes were a revealing index of hardship. Population growth throughout the 1930s reached the lowest point since the 1880s through a combination of plummeting immigration and birthrates. The number of immigrants accepted into Canada dropped from 169,000 in 1929 to fewer than 12,000 by 1935 and never rose above 17,000 for the remainder of the decade. During that time European Jews fleeing Nazi Germany were denied a sanctuary in Canada (see Refugees). The number of Canada's deportations, however, rose from fewer than 2,000 in 1929 to more than 7,600 just three years later. Almost 30,000 immigrants were forcibly returned to their countries of origin over the course of the decade, primarily because of illness or unemployment. Canada's birthrate dropped from 13.1 live births per 1,000 in 1930 to only 9.7 by 1937, the lowest ratio until the 1960s. During the 1930s, 50 years of urbanizing momentum were reversed as Canada's rural population (outside of Saskatchewan) grew more rapidly than its urban population. For many of the unemployed "going back to the land" was preferable to a miserable existence on urban relief. Canada did not have an adequate system of dispensing welfare to the jobless. Although unemployment was a national problem, federal governments led by Conservative Prime Minister R.B. Bennett (1930-35) and his Liberal predecessor and successor W.L. Mackenzie King, refused, for the most part, to provide work for the jobless and insisted that their care was primarily a local and provincial responsibility. King, who was prime minister when the Depression first started, was reluctant to even acknowledge that an economic crisis had struck Canada – a stance that led to his defeat at the hands of Bennett in 1930 (King and his Liberals were re-elected in 1935). Federal reluctance to tackle unemployment contributed to fiscal collapse in the four western provinces and in hundreds of municipalities, as well as a haphazard, degrading standard of care for the jobless. Monthly relief rates for a family of five varied from $60 in Calgary to $19 in Halifax. Although there were no official accounts of starvation, reports by medical authorities of scurvy and other diet deficiency diseases were common throughout the decade. 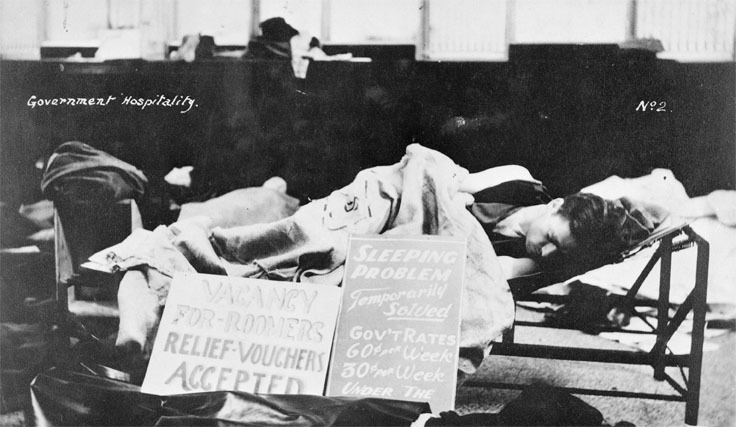 Local governments refused to aid single, homeless men, and so between 1932 and 1936 the federal government established unemployment relief camps. 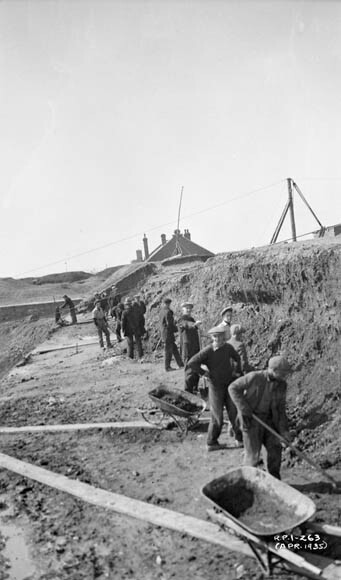 Run by the Department of Defence, the camps paid the men 20 cents a day for construction work in the bush. In 1935 a protest against conditions in the camps culminated in the Regina Riot - Canada’s most violent episode of the Depression, in which one policeman was killed, dozens of men were injured and 130 were arrested (see On to Ottawa Trek). 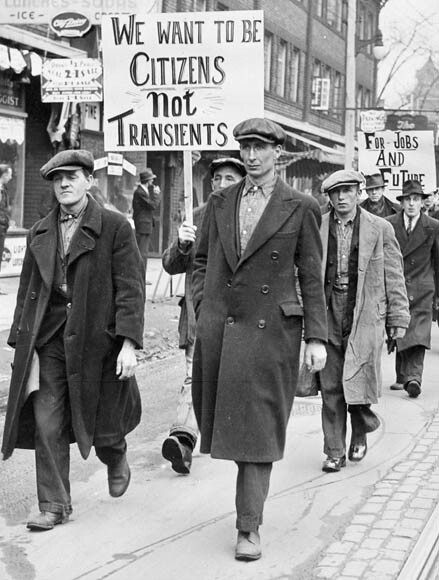 The Depression changed the way Canadians thought about the economy and the role of the state. The previous faith shared by both the Bennett and King governments and most economists -- that a balanced budget, a sound dollar and changes in the trade tariff would allow the private marketplace to bring about recovery -- was misplaced. In response, the Depression spawned a variety of political reform movements, particularly at the provincial level, which advocated the use of the state to initiate recovery. 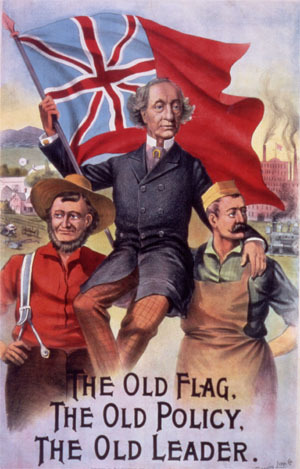 The reforms included the inflationary Social Credit theories of Alberta Premier William Aberhart, the "Work and Wages" program of British Columbia Premier T. Dufferin Pattullo, and the democratic socialism of J.S. Woodsworth and the Co-operative Commonwealth Federation. The Union Nationale in Québec, led by Maurice Duplessis, H.H. Stevens's Reconstruction Party and the New Democracy movement of W.D. Herridge were also triggered by the Depression. The Communist Party of Canada was virtually outlawed from 1931 (when nine of its leaders were arrested and convicted under the Criminal Code for being members of an "unlawful association") to 1936, and was banned when war was declared in 1939. However, affiliated groups such as the Workers' Unity League, the Relief Camp Workers Union and the National Unemployed Workers Association played a significant role in organizing the unskilled and the unemployed in protest marches and demonstrations. Although the national impact of these organizations was minimal, the Depression did ultimately result in an expansion of state responsibility for the economy and for social welfare. 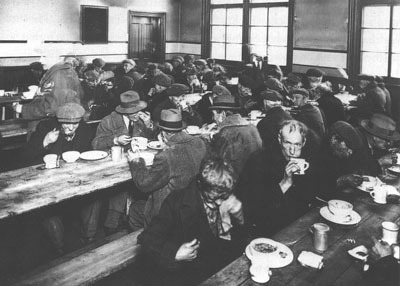 In 1934 Bennett's government created legislation to establish the Bank of Canada, which was charged with regulating monetary policy; in 1935 the Canadian Wheat Board was created to market and establish a minimum floor price for wheat; and in 1940 the federal government assumed responsibility for the jobless by introducing a national unemployment insurance scheme (see Employment Insurance) and employment service. The Depression also legitimized the economic theories of British economist John Maynard Keynes, who argued that, if private investment failed to produce full employment, the state must initiate public investment through deficit spending to create jobs. Keynes's ideas influenced the National Employment Commission report (1938) and the report of the Royal Commission on Dominion-Provincial Relations (1940). The latter was important in generating the idea of equalization payments from Ottawa to the provinces. Not until war broke out in 1939, however, did Keynesian economics become a deliberate part of government policy, and it was the massive state expenditures necessitated by the war that finally reduced unemployment to minimal levels by 1942. See also History Since Confederation; Business Cycles; Bennett’s New Deal. The Great Depression: 1929-1939Check out Pierre Berton’s best-selling book about the bleak years of Canada’s Great Depression at the Indigo website. La Grande Dépression des années 1930 au CanadaUn aperçu de fait rempli des principales causes et les effets de la Grande Dépression au Canada. De Bibliothèque et Archives Canada. Silver and Gold: Bennett and the Great DepressionA video about Bennett’s handling of the political and economic crises brought about by the Great Depression. From the McCord Museum. Come for a ride on the Bennett Buggy AKA the Oatsmobile!Interesting anecdote about automobiles converted into horse-drawn vehicles during the Great Depression. From the Western Development Museum in Saskatchewan. ”We Cannot Shoo These Men to Another Place”An academic paper about the conditions which spurred the various “On to Ottawa” treks in Canada during the Great Depression.